I've made no secret of my love for VW Beetles and enlarged things, so it's pretty easy to see why this 1.5x-scale Baja Bug is appealing to me. Built on (and named after) an old airport fire truck, Big Red is the tractor-chassi'd colossal Beetle you've been hoping for. The brothers, Kirk and Erik Strawn, grew up with old VWs, and while the initial motivation for the idea is unclear, I'm never going to fault anyone for doing anything so pleasingly absurd. The old airport fire truck chassis seems to have a rear-mounted engine fitted, and it's possibly still air-cooled. There's no evidence of a radiator, and a sign on the back does say "AIR-COOLED" so if that's the case, big points for accuracy. Is that a turbo'd Type I motor back there? Maybe. I'll look for better pictures. They hired a teenaged welder to make the body, which is nicely done, and made to resemble a Baja Beetle, possibly inspired by the big tractor tires and somewhat easier fabrication. The 9-foot tall Beetle seems to have made the Burning Man rounds, and still sports a rough, unpainted surface which fits the look well. In the dark, the body is outlined with LED strips that pulse and change color according to the music blaring out of the car's many speakers. 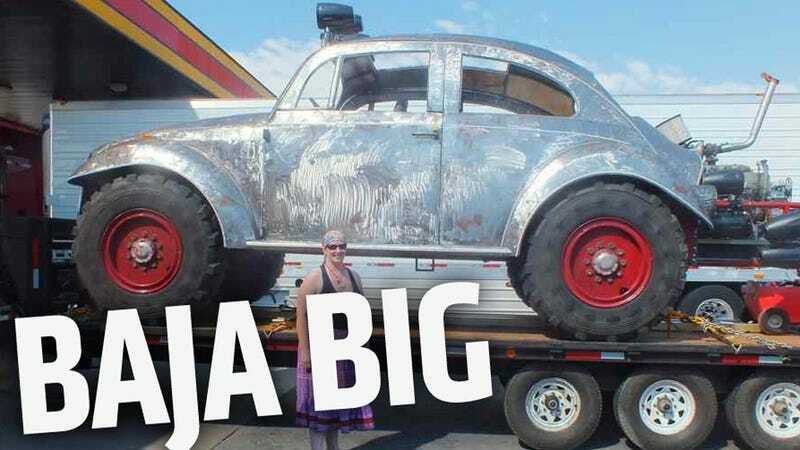 There's local news video here, and all these stories seem to have the quote "Two brothers from Iowa take the term "slug bug" to a whole new level." which I think makes no sense. Why would the term "slug bug" imply anything about scale?